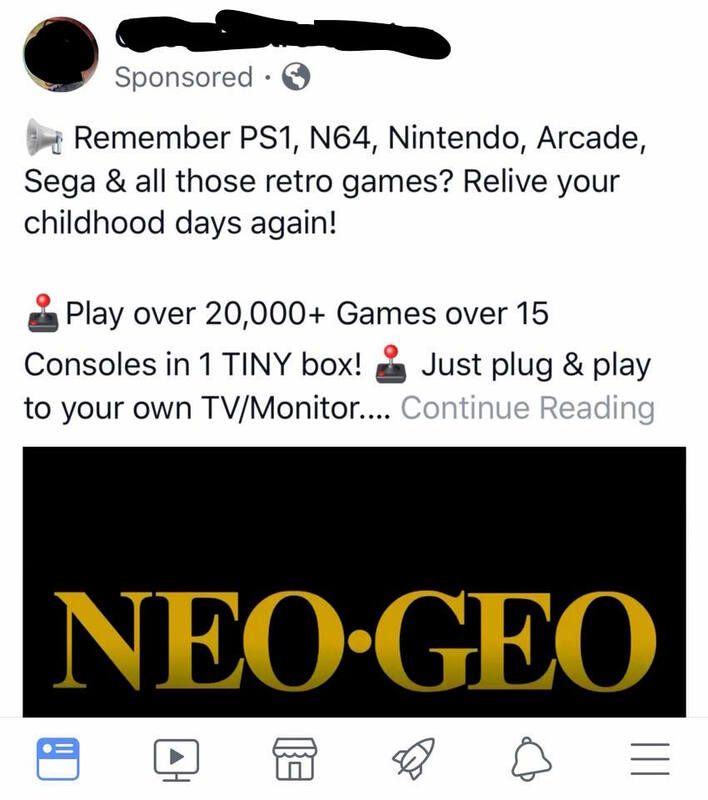 The image to your right is an example of something I see almost every time I open Facebook these days - a "sponsored" ad for some crappy knockoff of the Nintendo Classic. You can't get away from these things. They pollute your timeline multiple times per day with messages about "Christmas specials" and "saving 20%" if you buy it RIGHT NOW. Worse still there's absolutely nothing you can do about it, and if you'll bear with me for a minute, I'll tell you why. Anyone selling a plug and play with 300, 600 or (good God) 20,000 games on Facebook or anywhere else is blatantly doing something illegal. Atari Flashback is legal. Super Nintendo Classic Edition is legal. AT Games Genesis is legal. They paid for the rights to distribute the software. If it has over 100 games it's virtually guaranteed they didn't pay for ANY of them and just loaded a Pi with games and slapped a shell on it. To clarify this is not an anti-emulator rant. There is a legitimate consumer need to "try before you buy" when it comes to classic games. Why should you shell out anywhere from $2-$200 on a cartridge or disc for a vintage game system without knowing anything about the product? You might be able to watch a video if somebody's done a Let's Play of it, but that still doesn't tell you how it feels to actually try it for yourself. Speaking of $200, the ridiculous amounts that some classic games go for these days means you might be saving up for a LOOOOOONG time before you'd get to buy some games, unless it comes out for a Virtual Console type system as a paid download ($5-$15) or in a manufacturer compilation ($20-$40). Even in the latter cases you'd still want to try it first. There's a significant difference though between test driving a game for yourself in emulation, in the privacy of your own home, and loading up hundreds of games on a Pi and selling it to people on eBay or Facebook. In both cases another company's intellectual property is involved, but only in the latter case are you actually selling something you don't own or have the license to. This used to be strictly the domain of bootleg plug-and-play "Famiclone" systems imported from China, where Nintendo seems to be either unable or unwilling to crack down on rampant piracy. The manufacturers of these systems often try to hide what they are doing by changing the names of the games or the graphics in them, but once you play a Chinese Famiclone it's pretty clear what they are. Unfortunately you can't even report these ads when you see them on Facebook, because FB's policy is that the only one who can complain about bootlegged video games is the actual publisher or author of the games. If you see one of these ads and you want to report it you're 100% out of luck. This actually applies to just about anything and it's kind of absurd. Imagine if somebody was selling a fake "Mona Lisa" on Facebook for $10,000,000. Is Leonardo da Vinci supposed to rise from the grave and file a complaint? Aybody with two functioning brain cells to rub together should be able to report it as such. You could try to tell Nintendo/Sega/Capcom/et cetera about it... but they won't do anything. Even though it's their own property they just don't care. It's too "small fry" for them to bother policing FB. I encourage people to try games via emulation, but please don't buy these knockoff Nintendo Classics and "20,000-in-1" game systems from fly by night scumbag sellers. Not only do they not deserve the profit (the creators and/or owners of the games do) but when you get to the point of shoveling that many games into a system you're not concerned about quality. The emulators are not going to be optimized. The roms are not going to be error checked. The buttons on the controller may lag or not function correctly at all. Why would you throw good money away on something this bad? "More" isn't better in this case. Buy an authorized product with 20-30 games on it that they took the time to license properly and emulate accurately. Don't be afraid to try something before you buy, but give the money to the right people and not con artists stealing from real artists.